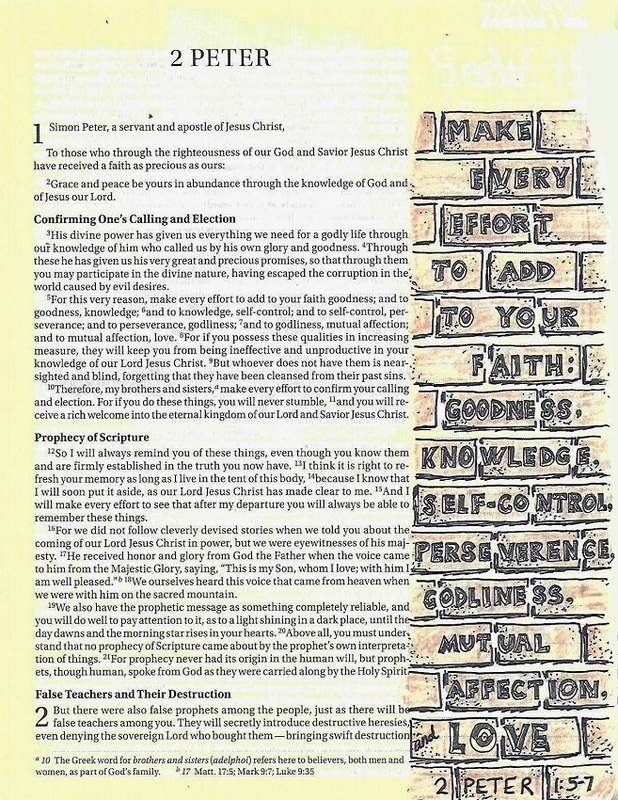 In your Bible today, working in the book of Ruth, combine several versions of the edited block letters. I did some skinny, some wide, and even brought in those with slashed edges from prior lessons. Also, in the mix are some basic round letters and a bit of script handwriting. Use whatever mix of styles YOU are comfortable with. So what ties it all together? The way the words interlock together and the consistent colors throughout. I combined my text block with the peacock from the Drawing Room lesson for this week in the same colors. Oh, how I love that peacock! Skipping back and forth between different types of projects is sure keeping me on my toes! 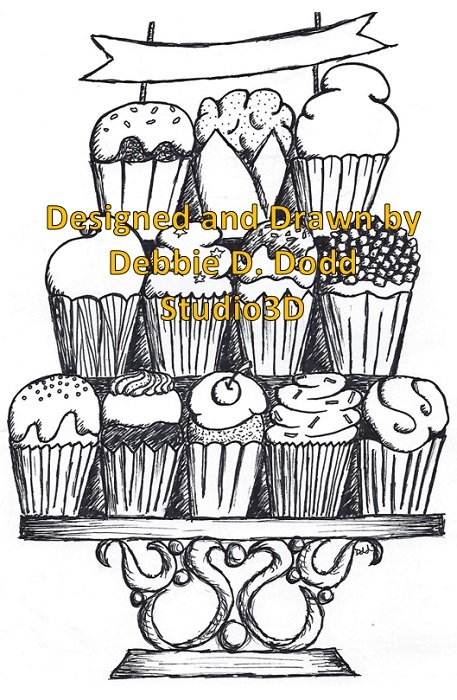 In the Whimsical Drawing class the next assignment was a tiered plate of sweets. I turned mine into cupcakes with a blank banner at the top so I can print it out and fill the banner with a sentiment for whatever the occasion will be (if used on card fronts). 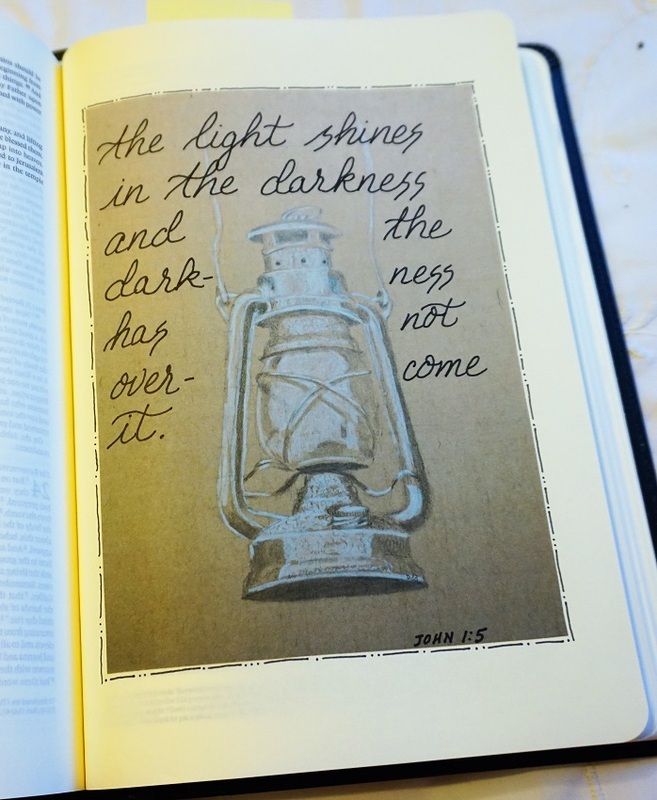 This is another one that I reduced to fit in my interleaved bible. 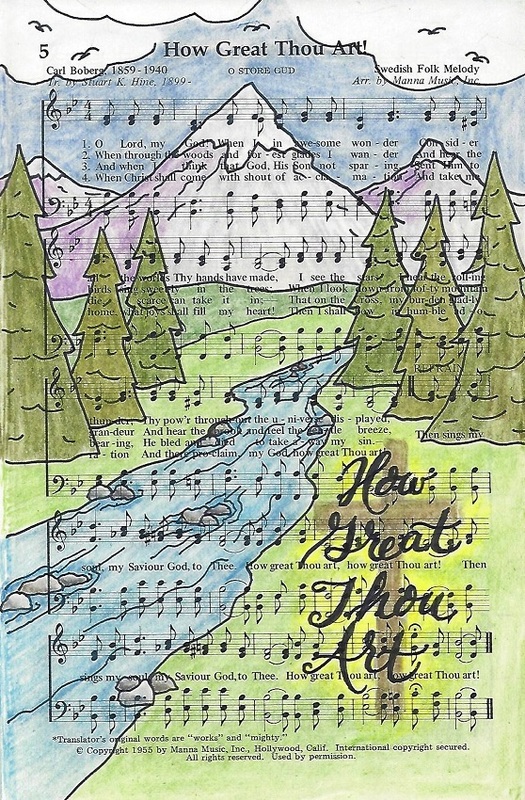 I colored with markers and added a short scripture snippet in the banner. This is a really fun class! 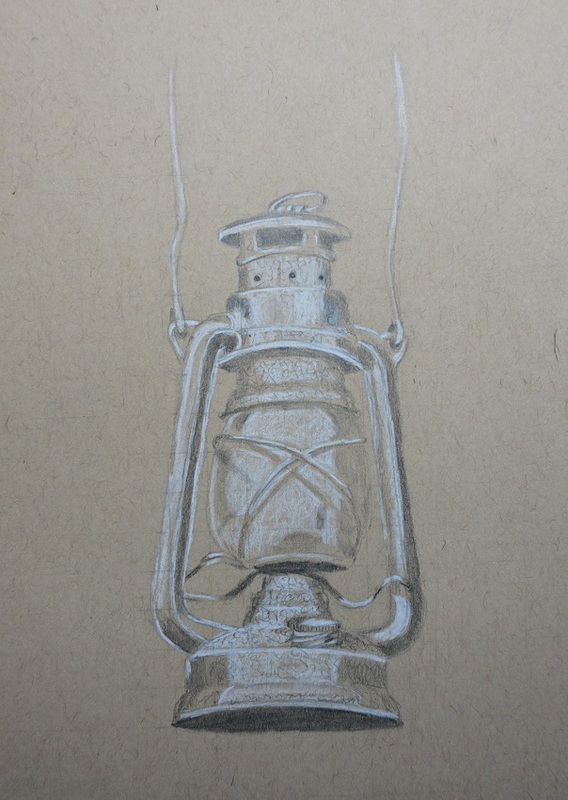 This is anoth in the lessons that uses toned paper. The highlights in the original photo were totally blown out so I reduced the contrast in mine. The original shows the bird as pretty much a black blob with a few stark white highlights along the top. In many drawings I couldn't even figure out what it was supposed to be! I think there is only one more lesson to go in this class. On the plan for lettering lessons, whose books that have a 1st and 2nd are combined into one lesson. So here we are covering BOTh books of Peter. Let’s have some fun this week including artwork right in our letters. The base of these will be the now-familiar basic block letters. For the intro today, write out the letters for the book(s) of Peter, change the outlines to casual double lines. You can then draw patterns within the letters – using either different patterns in each one or a consistent pattern throughout the word. 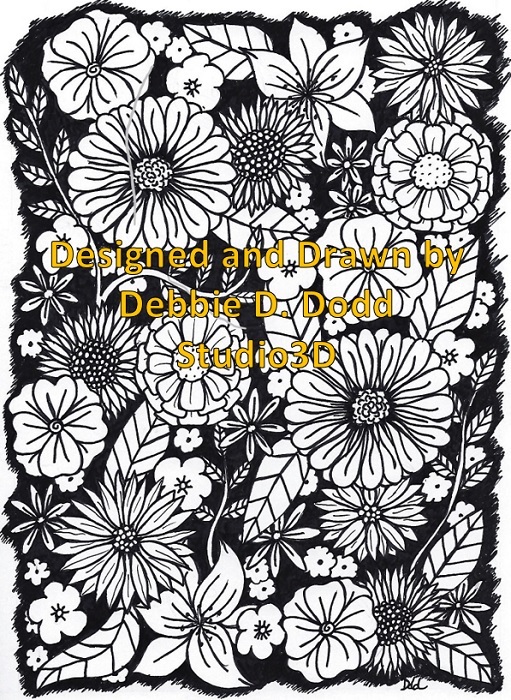 You also have the option of leaving the word in black and white or coloring in the patterns. As shown yesterday, the first alphabet we will practice this week is basic block letters filled with patterns. 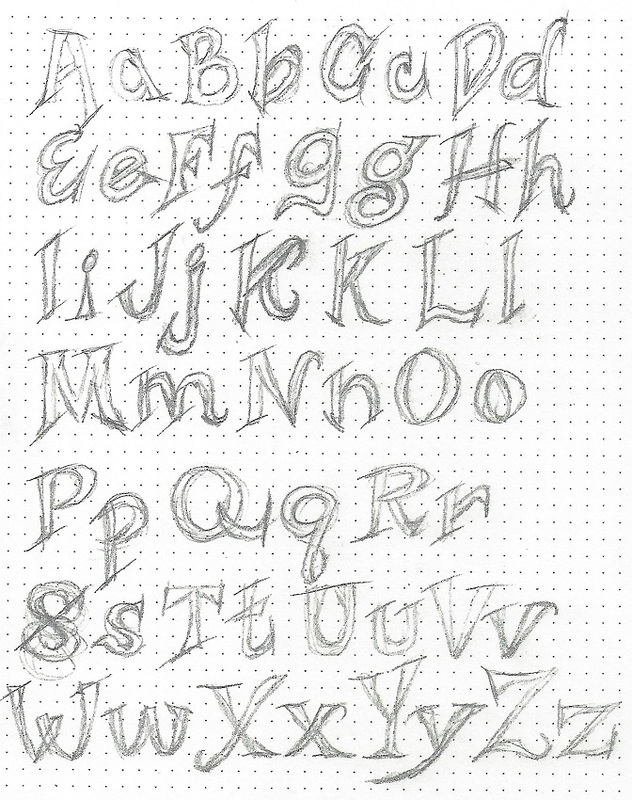 In this sample alphabet, I did not use the casual sketchy lines like Day 1. But there are lots of ideas for how you might want to fill your letters. 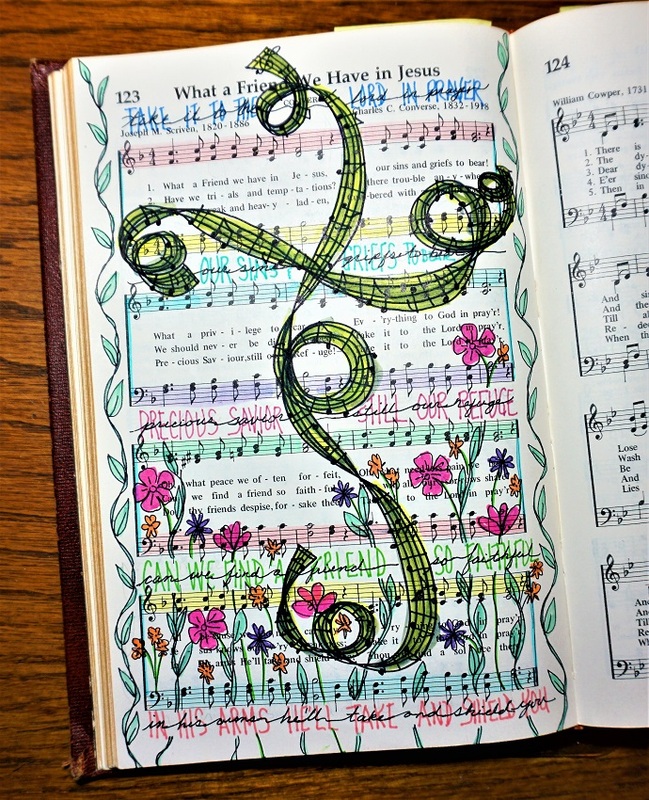 When you are using them in your Bible journaling, you can fill your letters with doodles that fit the theme of a verse. Remember, you have the option of color or black and white. There are two sheets for the alphabet today. 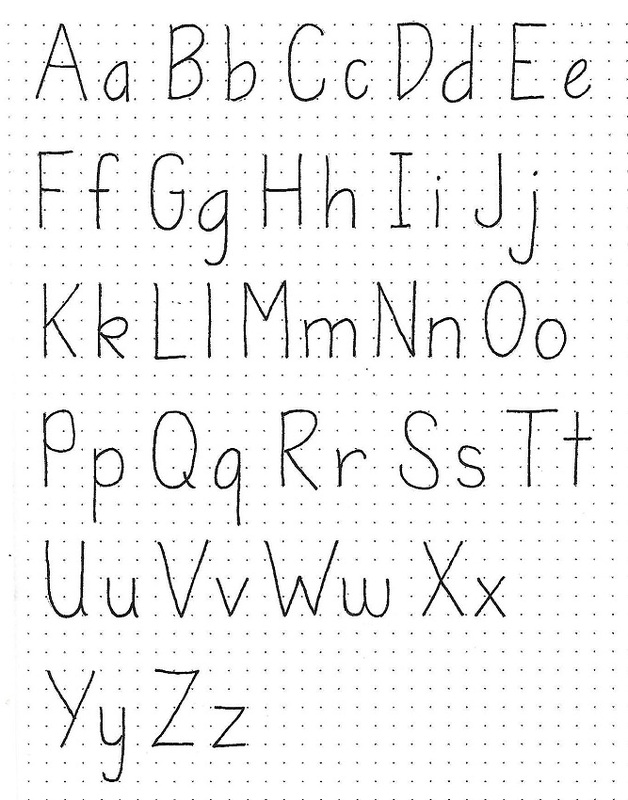 For chiseled letters, 1) start by drawing the basic block letter alphabet (caps only). 2) At each end, draw a little triangle 3) on the straight letters, draw a diagonal at the intersections 4) split the elements in half lengthwise, drawing from the points of the triangles 5) connect that center line with any new angles formed 6) add center line to remaining element from the ends of the triangle and the diagonals 7) shade the top and right segments. Letters with curves get an arrow V along the curve. This is to define where the shading will switch from one side of the element to the other. 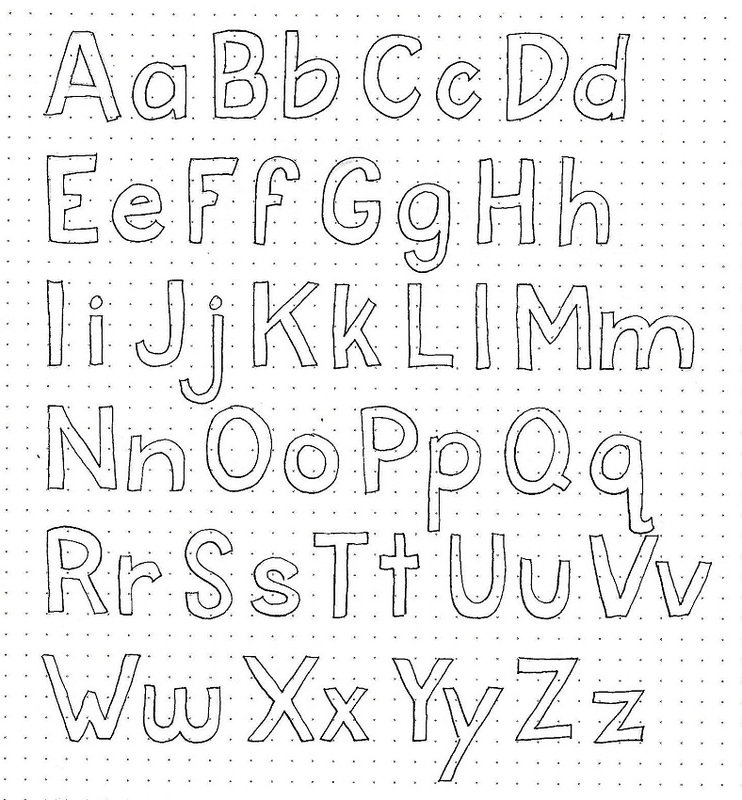 Use the steps described to turn your basic block alphabet into chiseled letters. Then go on to page 3b for shading. After you have drawn your carved alphabet it is time to work on shading. Since the letters are meant to look like they are indented into stone or concrete, the shading will go on the right and top of all the little bits. The light would come from the top so the top, indented spaces would be in shadow. 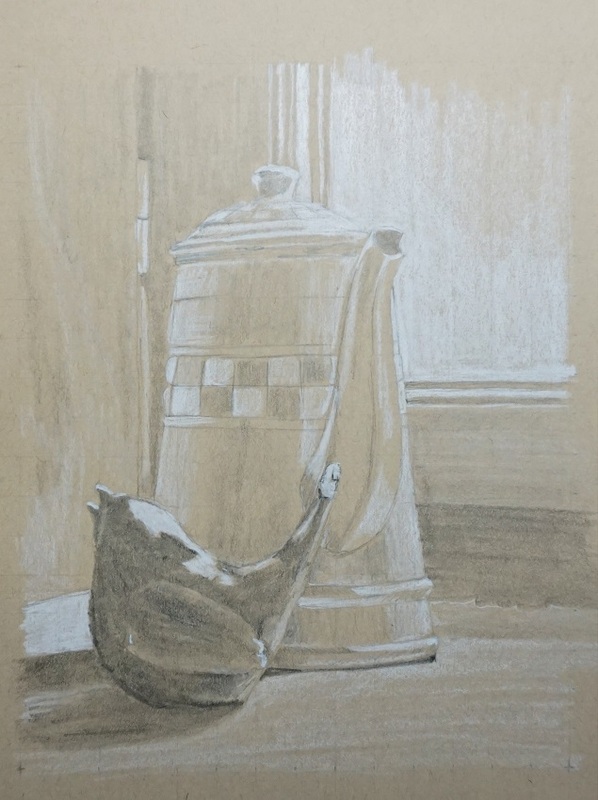 It is difficult to remember where the shading goes, so it may take a bit of practice to get it right. For this reason, do your shading in pencil so you can erase if needed. I keep a copy of the alphabet with and without shading so I can work on structure separately from lighting. 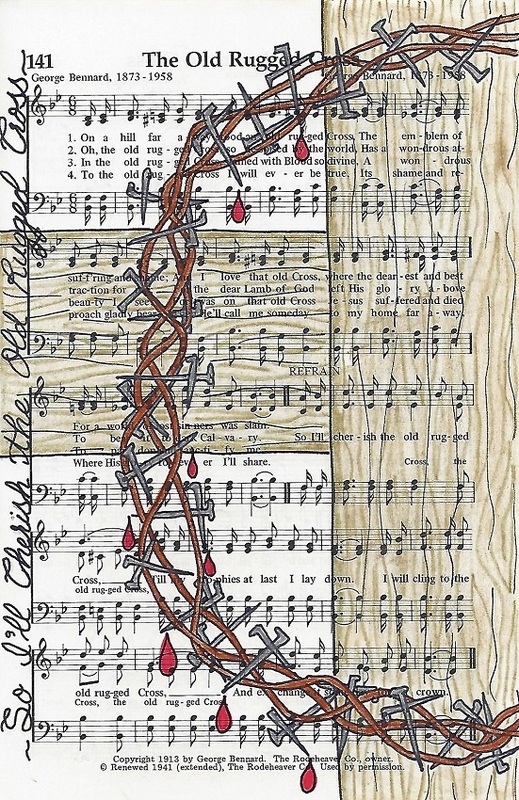 This piece is to demonstrate that the art fills can be either outside OR inside the letters. And, as a bonus, fills inside the letters can be art objects rather than doodles. I used the sketchy style of outlining the basic block letters. Then I drew, in pencil, various objects of clothing right across the words. On the first line, I used markers to trace the clothes only outside the letters. On the second line, I used the markers to trace the clothing only inside the letters. The rest of the text was written out using basic round letters in all-caps, using the same markers. Go have some fun with fills. Working with the carved letters on this small scale was quite a challenge. I wanted the words to look like they were carved right into the brick wall (from the Drawing Room this week) So I drew the wall in pencil, then penciled and inked the words, inked the bricks, erased all the pencil and added the shading to the letters and the color to the wall. 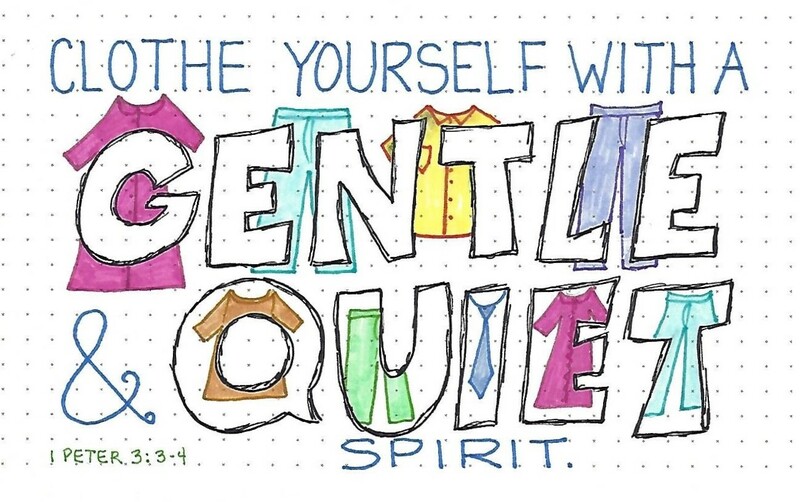 Use any one of the styles of filled block letters in your Bible to journal in 1 Peter or 2 Peter. 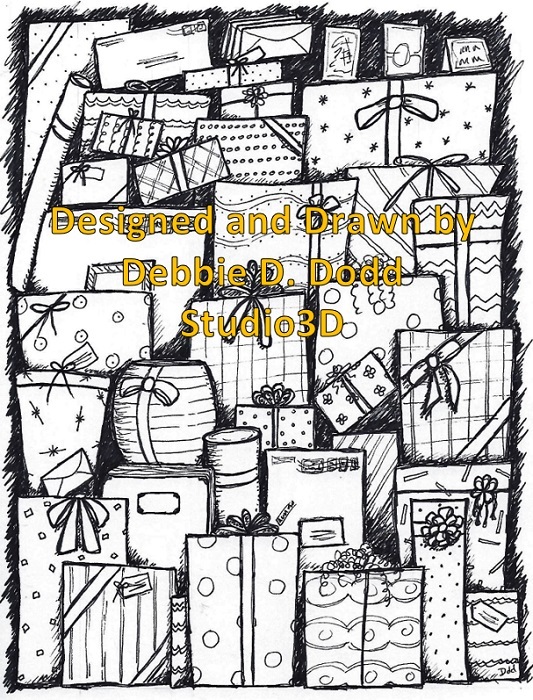 The continuation of the Whimsical Drawing class had us working on a page of stacked gifts. What fun these were to draw! It is certainly a process. But the instructor draws all on video and talks through the things to consider as well as showing ideas and techniques. I printed out her sample sheet but then put it away out of sigh and drew from my memory and imagination. I may scan and reduce to print out for card fronts that I would then color. 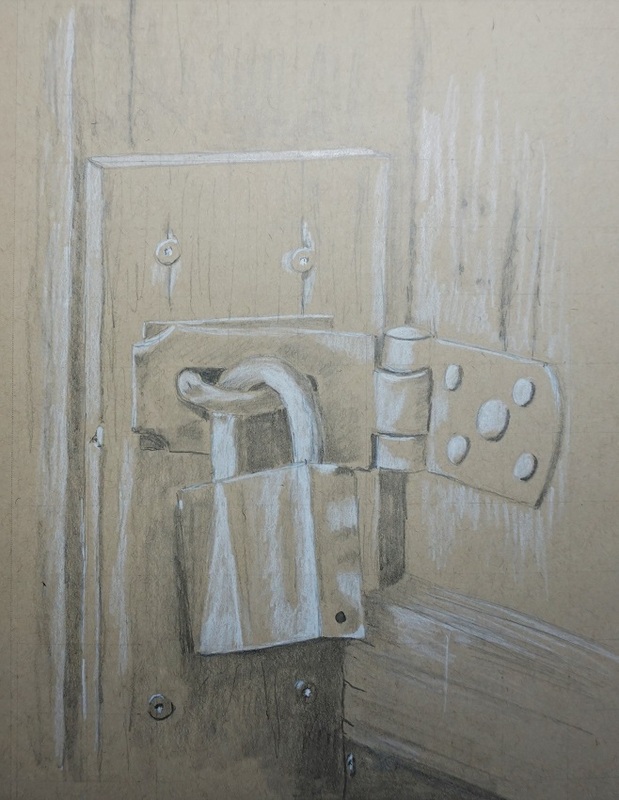 Until I started this Drawing 101 class I had not used toned paper for drawing since I was in college (more than a few years ago). But I am discovering that I really do like the effect. Good thing since I have a whole notebook of it now! This was the 8th lesson from the class. Again, we were provided with a photograph to work from. I do two things to help myself: 1) I use my computer to change the photo to black and white and then play with the lighing and contrast so I get good details to print. 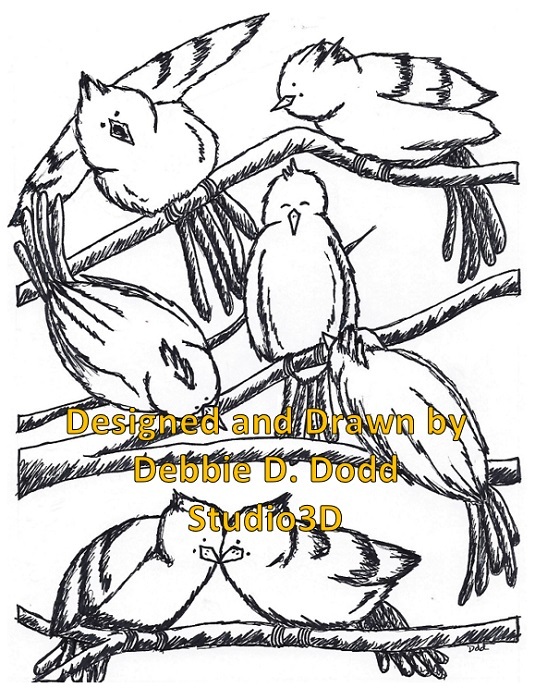 2) I draw a grid on my printout and on my drawing paper and use the gridlines to transfer the drawing outlines. These two steps help me immensly in getting a good result. Our photo was a whole bundle of garlic bulbs with one featured. We were given the option of zooming in to work on only the featured bulb and working in more detail. That is the option I chose. 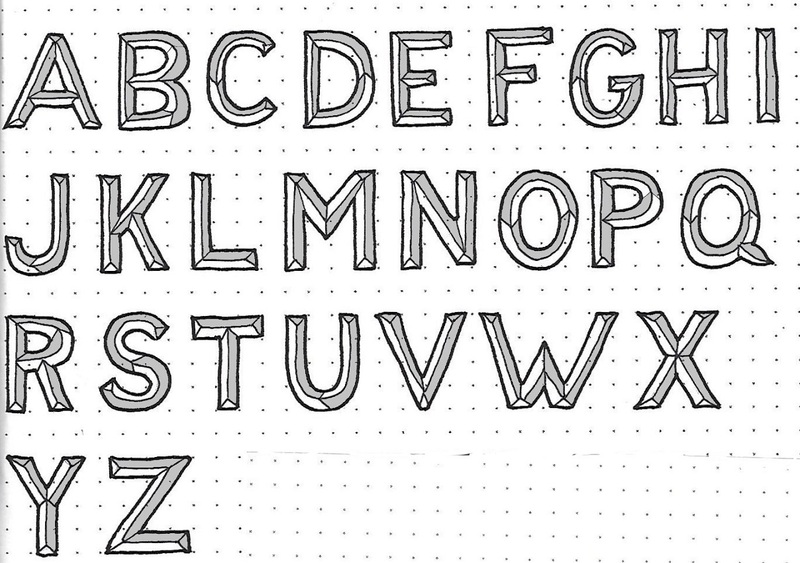 On we go with the lettering lessons. This week they were unusual twists on block letters. This week we will be exploring three ways to get a little more creative with our block letters. This is one of the novelty prints we will explore on day 3. But in the meantime, have fun recreating this intro word for the book of Judges. 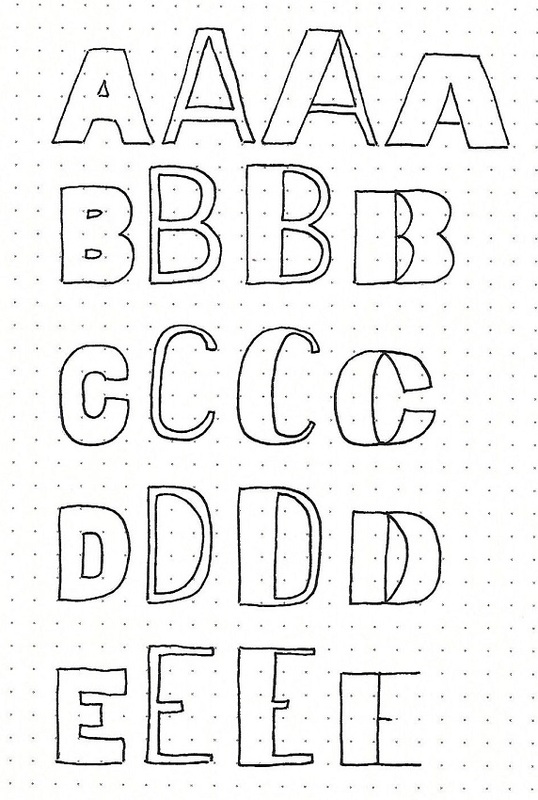 The lettering starts in pencil with a big, fat outline of the general letter shape. Then a small Basic Round Capital is attached to the edge of the letter. Draw the little letter with colored ink and then use black for the big outline. Erase the pencil. There’s lots of fun to be had by making even small edits to basic block print letters. Today, explore this by making an alphabet that makes the letters shorter by one unit and wider by making the elements 1 ½ units instead of 1 unit like we drew originally. You can see that I still had problems with that pesky S! What other changes would you make on an alphabet like this? Draw any optional forms you like. Oh, goody! We’re back to the letter-in-a-letter alphabet that we introduced on day 1. In review, draw the outline of the big letter in pencil (outline only - no internal lines. Then draw in the little letter along the edge. Use colored ink to trace the little letter and black ink for the large outline. Erase the pencil. This really goes pretty quickly and looks great in use. 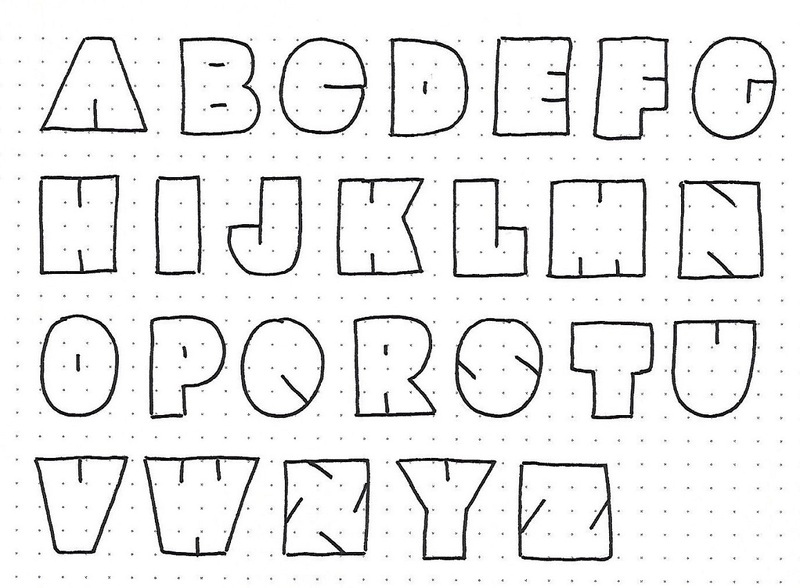 This is another simple way to make block letters. Basically, the letters are only outlines. Where the regular letter would have internal spaces, all of these details are accomplished with only slashes. None of these shaping lines have any dimension – just a line. These look good when overlapped just a little – each one to the right tucks behind the one preceding it. I couldn’t resist using the letter-in-a-letter style for this block of text. I used a lot of different colors for the little letter inserts so it has a lot of movement. Notice how readable this font is. 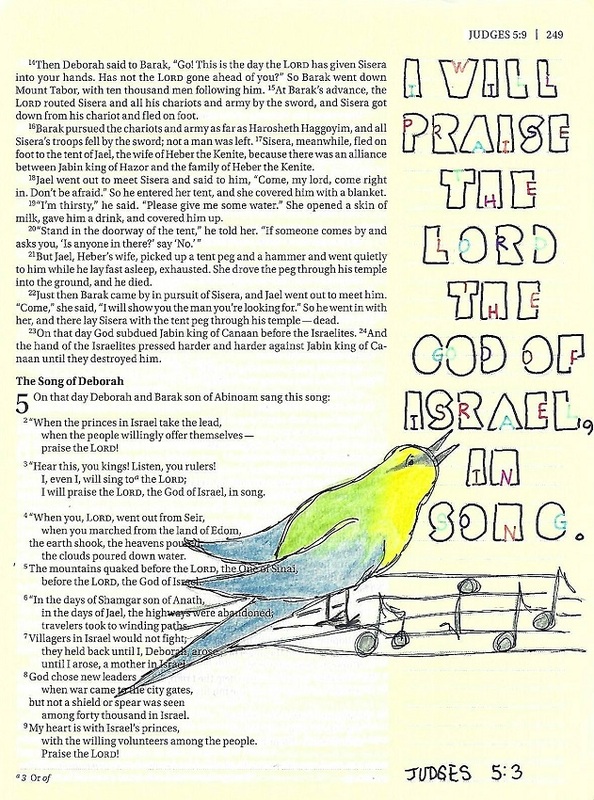 I illustrated this page using the songbird from this week’s Drawing Room and added a bit of music for him to perch on. In a Whimsical Drawing class the first lesson was on drawing fantastic flowers. These are all flowers made up as I went along. This was drawn entirely in Prismacolor pens. After the drawing was complete the background was filled in with brush marker. 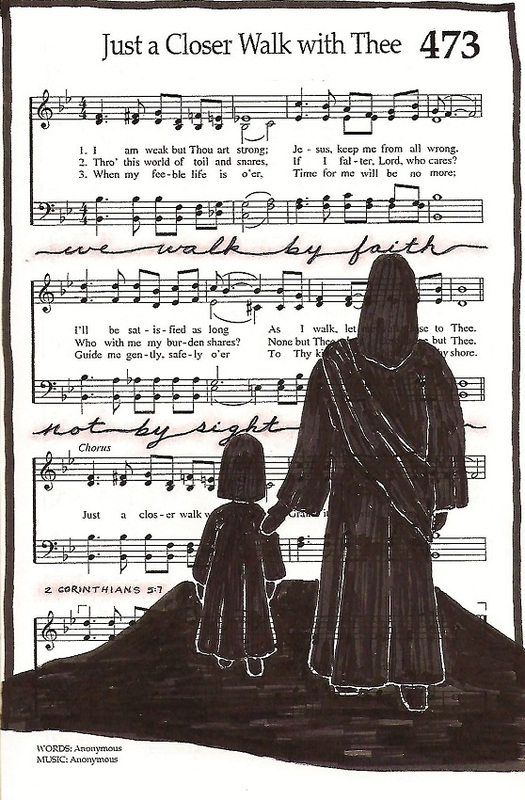 This was another drawing that I reduced and printed to go in my interleaved bible. 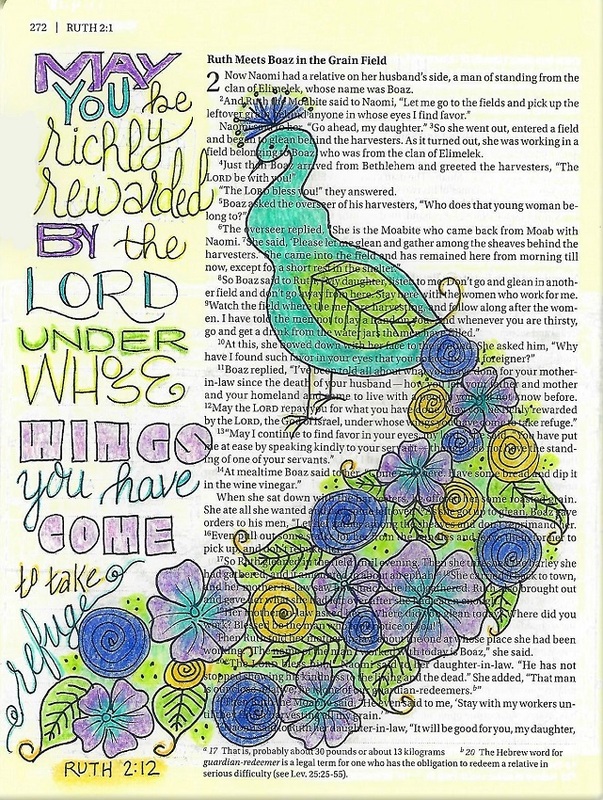 I colored my print with markers and lettered a scripture to the bottom of the page. 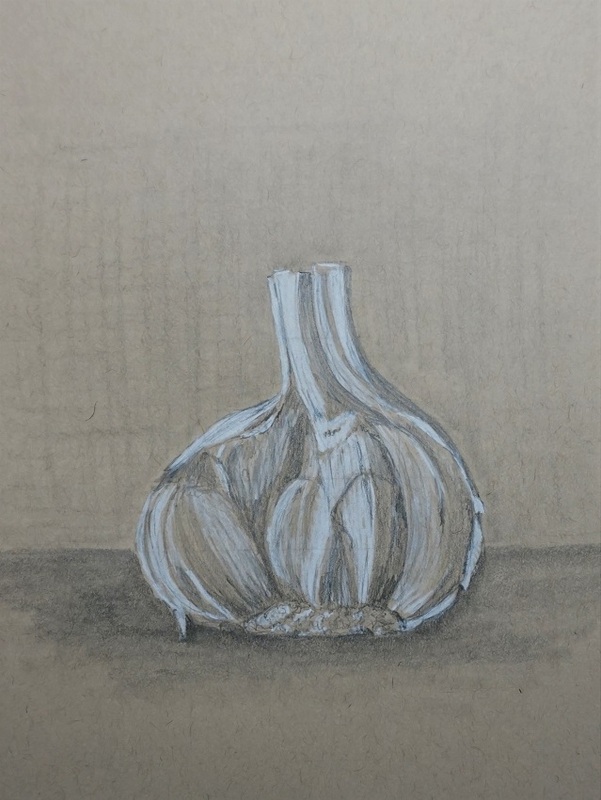 Lesson 7 in the class Drawing 101 is again working on toned paper (as are all the rest in this series). We were provided with a photograph to draw with the concentration on light and shadow. This one was of a padlock on an old door. 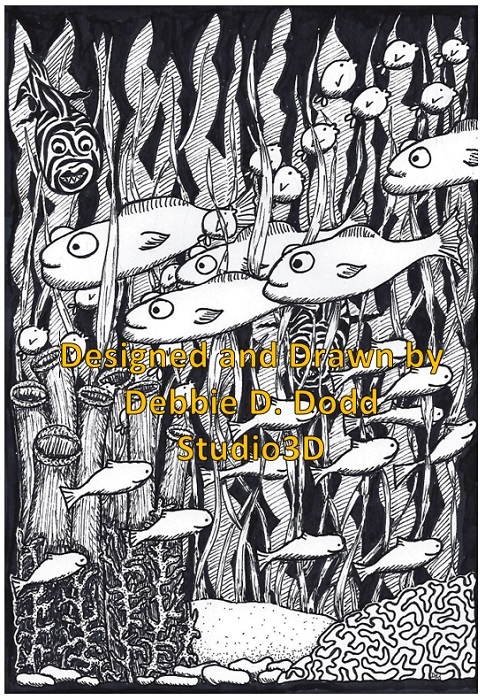 I liked my drawing so much that I scanned it and printed on plain paper in a reduced size. 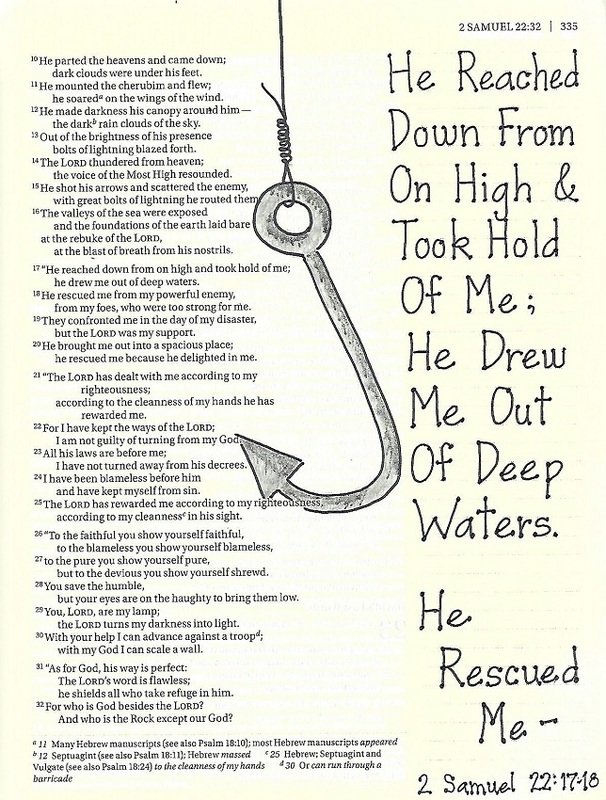 The I trimmed and added it to my interleaved bible and lettered a verse with it. 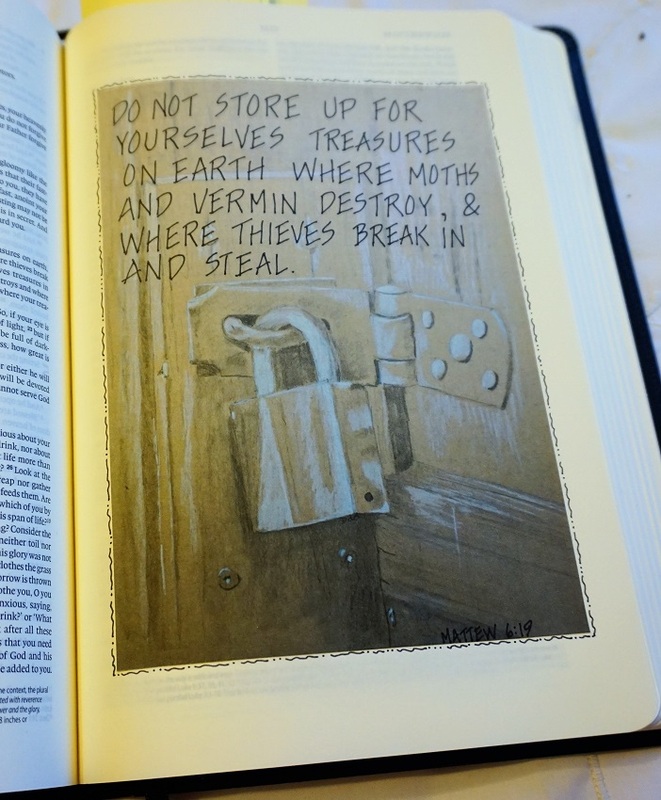 I really like this bible for glueing in full-page art. 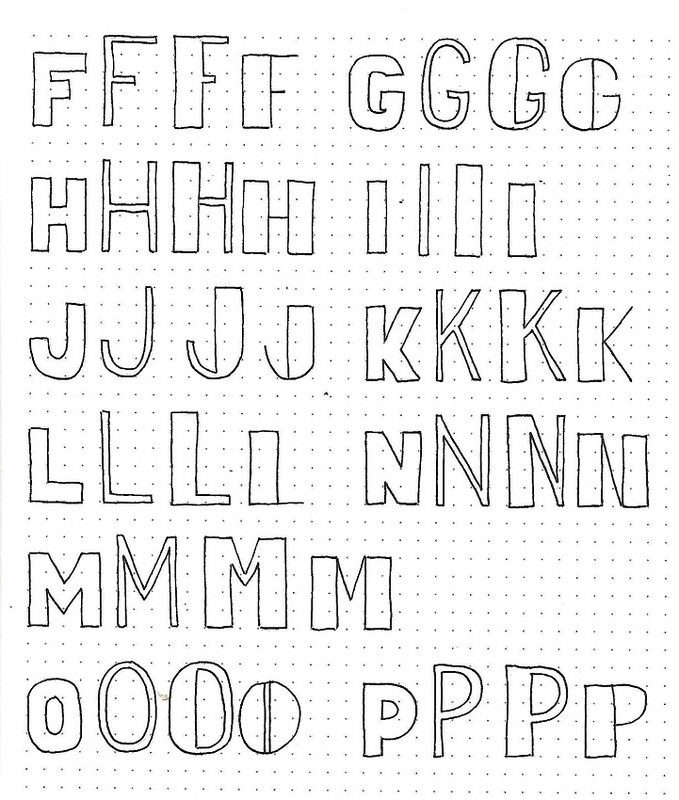 It was time for another lettering lesson in the progressive series I started January 1. This week the focus was on the book of Joshua. This week we are going to add to the block lettering in several ways. First up will be to create a lower-case alphabet. 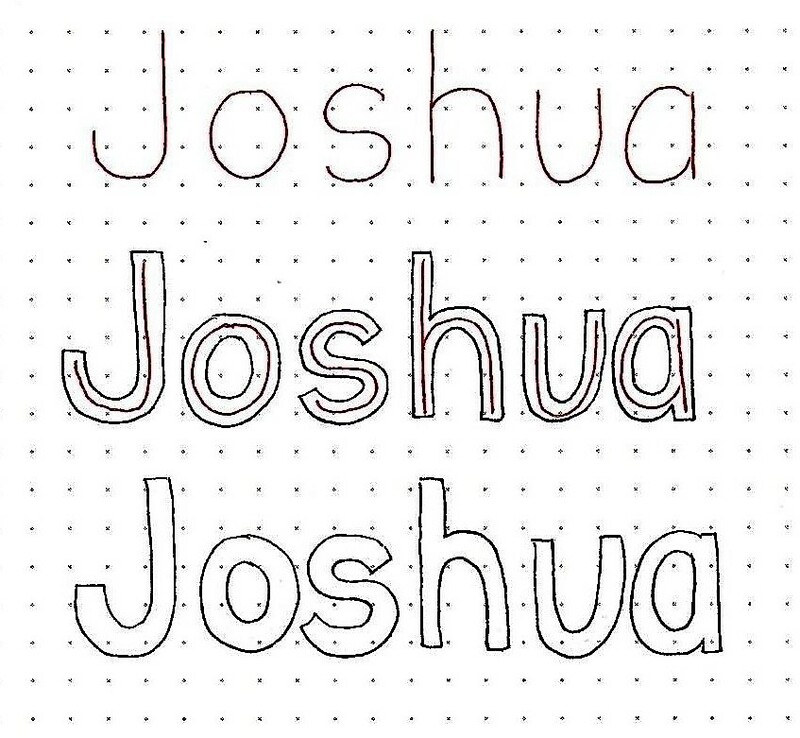 We’ll practice this process today using just the single word, ‘Joshua’. 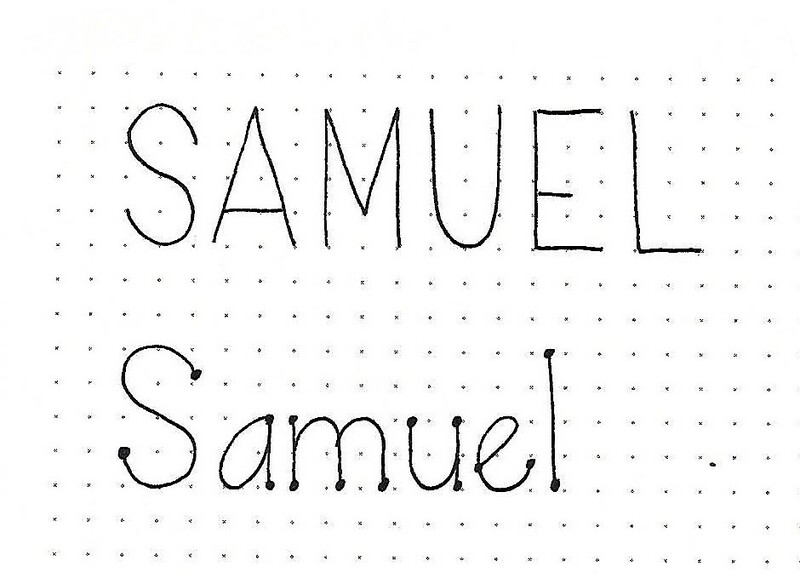 In pencil, lightly draw out the word in a basic print as shown on the first line. Then draw an equal width on all sides of these lines. Ink the outline only and erase the pencil guides. When I am using lower-case, I don’t make the elements as wide as when using all-caps. The lower-case letters are obviously smaller and have tighter internal spaces. Making the elements narrower gives some breathing room on the insides of the letters. Use the technique introduced yesterday to create a full alphabet for the upper- and lower-case block letters. 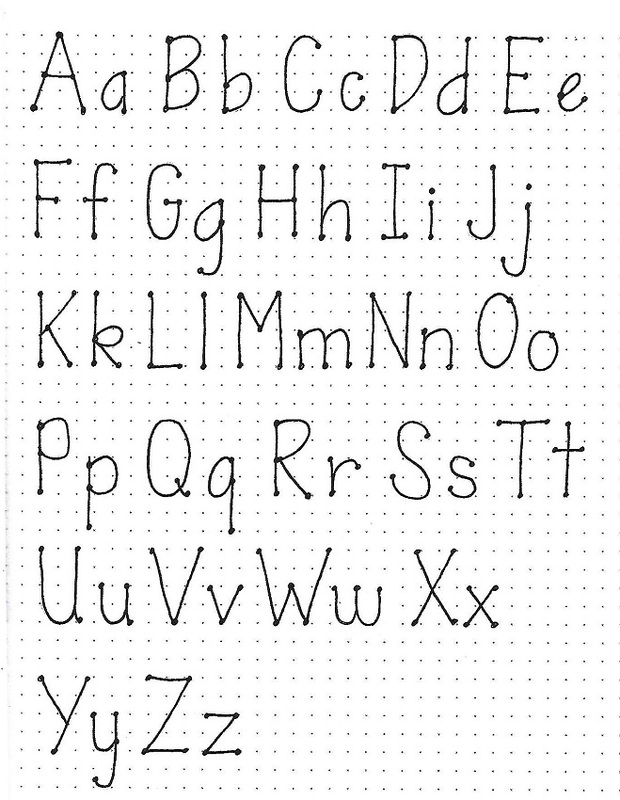 The final alphabet will be personal to you because it is based on your initial writing of the basic round print letters. What we are doing by using this method is helping you to develop your own personal style. You’ll note that my alphabet is not perfectly formed. 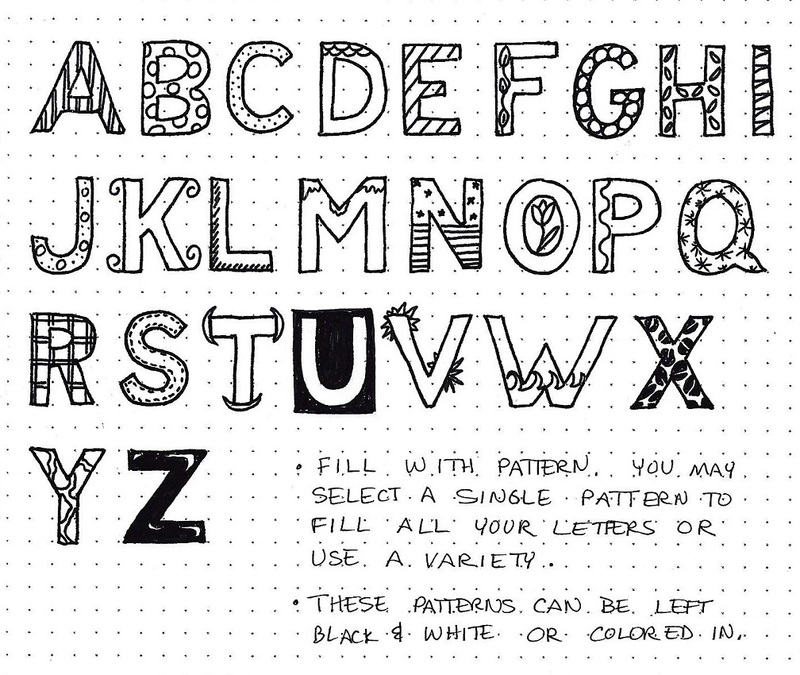 This is okay with me because it is just a reminder sheet on how to construct the letters. I am not trying to match an ‘ideal’. It’s time to play with color! I love this part of the process. 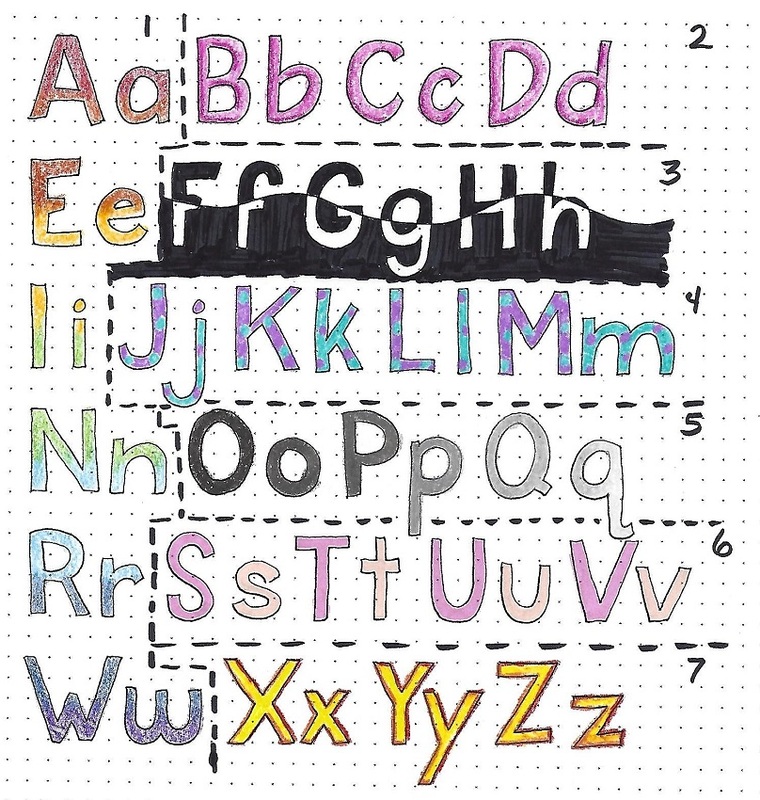 Today we are going to write up another sample page of block letters (or you can make a photocopy of an alphabet you’ve already done) and experiment with a variety of color options. I did all of my samples in colored pencil. 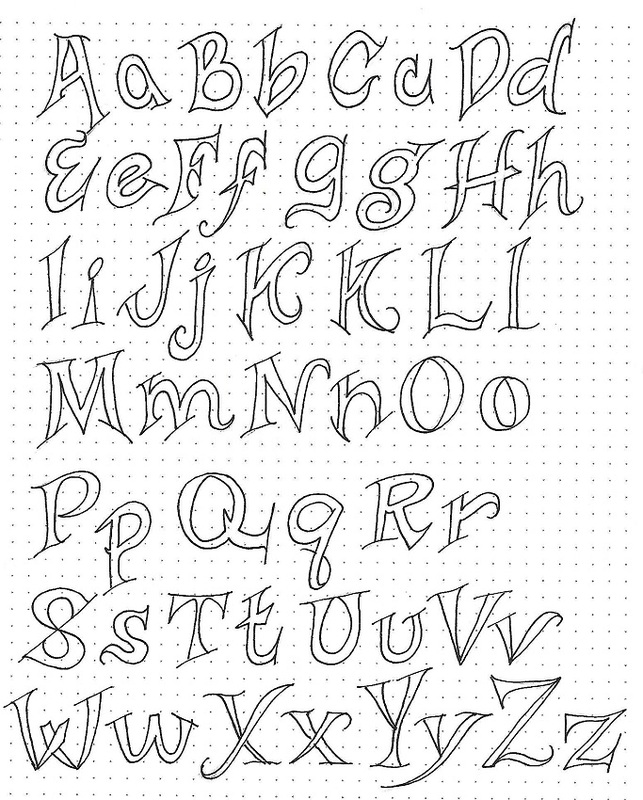 1) 1- Down the left side practice blending colors on your letters. Although you could do these letters with any two colors you wished, I did mine in the rainbow – blending two colors on each line: red-orange, orange-yellow, yellow-green, green-blue, blue-indigo, indigo-violet. 2) 2- Use two tones of the same color to make the letters dimensional. Darker shade goes on the bottom and left of elements and is blended with lighter shade covering the remainder of the letter. 3) 3- Draw a wavy line right through the word. Color the letters above the line and the background below the line. 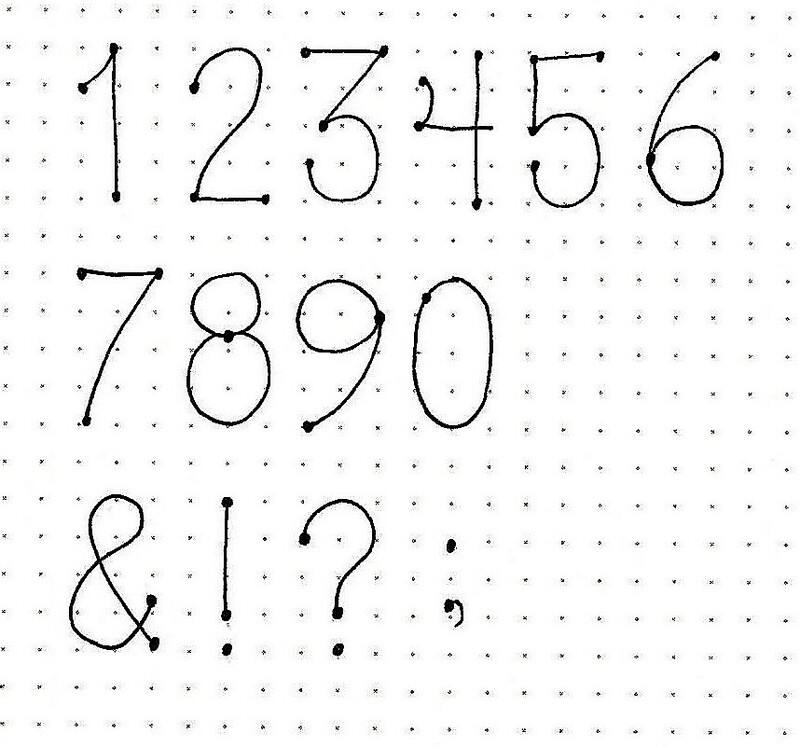 4) 4- Choose two contrasting colors to apply dots on every other letter. My caps have turquoise dots on purple letters and the lower-case have purple dots on turquoise letters. 5) 5- Six shades of the same gray were used to color successive letters. 6) 6- Alternating solids were used to color these letters. 7) 7- Dark colors (red and orange) were used to outline the letters and a bright (yellow) used to fill in. Things are about to get really exciting! 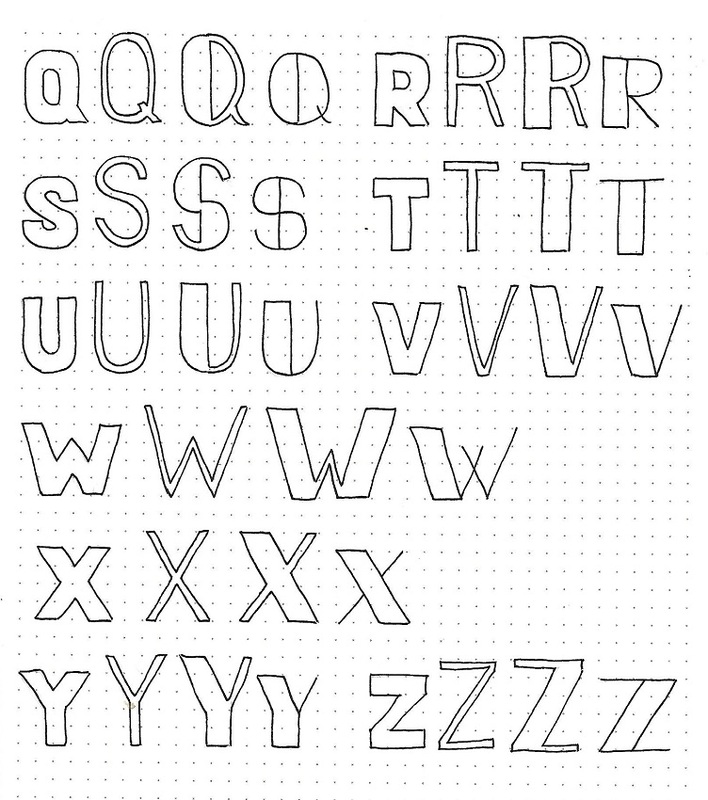 It is time to cut loose and design your own alphabet. I’m going to have you start with the basic block alphabet we learned this week. But on a new piece of paper, use your pencil to sketch lines that extend and expand in exciting ways around the basic forms. Draw an A in single lines, make it a bit wonky, draw the lines that make wider elements, change the ends to angles, add stylish serifs. . . If you don’t like where it went, erase and do it again! You can see I drew over and over mine, making incremental changes until they were very close to what I liked. Look over the whole sheet. Are there any letters that don’t seem to fit in? Now is the time to change them. Do you see elements that are repeating? Look for other places to incorporate those for a more cohesive look. Use ink to outline all your letters, making final adjustments as needed. Then erase your pencil. You did it! If you created a funky alphabet like I did, it would look great if the letters were allowed to rise above and sink below the baseline when using them on a project. 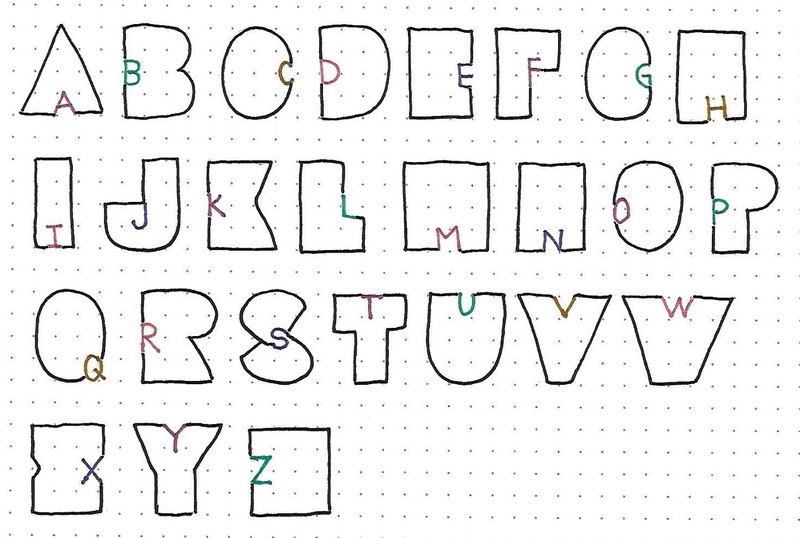 Use your new alphabet to write your full name, fitting the letters into shapes to create word art.